Condominio frente al mar con vista al mar desde todas las habitaciones en el piso 15! Una unidad de esquina con un dormitorio, un baño en el lado tranquilo de Ilikai Marina. Esta propiedad tiene una vista de 180 grados del Hilton Hawaiian Village Lagoon hasta Magic Island con la orilla del agua del Yacht Harbor 30 '+ directamente enfrente. 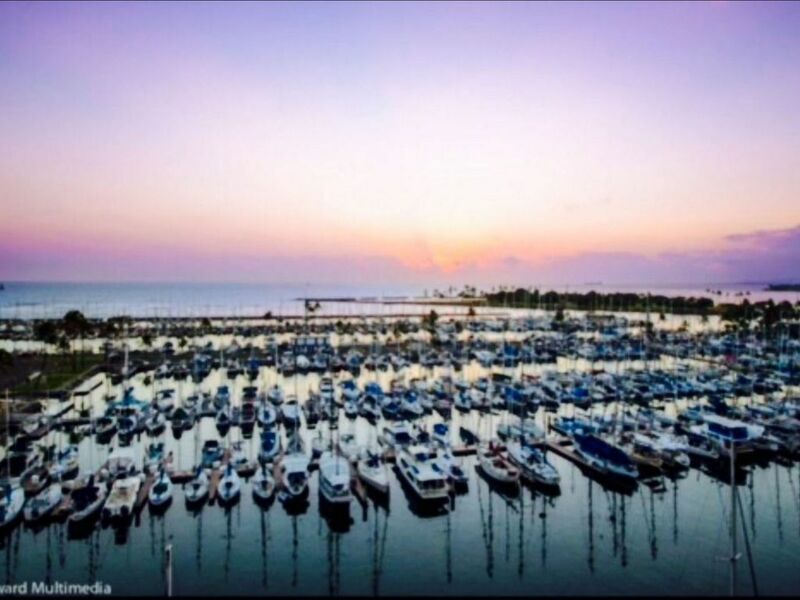 El Ilikai Marina es conocido por uno de los mejores lugares y lugares más seguros para alojarse en Waikiki. También tiene una pasarela sobre la calle a "The Modern", que tiene un excelente restaurante con impresionantes vistas, así como un salón de cócteles. Esta unidad tiene una excelente relación calidad-precio para la ubicación. Tiene un estilo Hawaiiana más antiguo, pero encantador y muy limpio. El precio refleja esto, ya que es una de las unidades menos costosas del edificio, por lo que es una gran oferta y le da más espacio para gastar su dinero en su aventura hawaiana, como un viaje en velero, una clase de surf, una excursión de buceo, una inmersión , una aventura en paracaídas o incluso un Luau! Great view with prime location. We loved being able to walk a short distance to the beach, restaurants and shops. The space was a perfect size and cleaned well. The only complaint was that both windows were not well sealed and were ill fitting so they shook everytime the wind blew. Made the trip exhausting just listening to them whistle and shake. Replace those and this would most definitely get a 5 star review. We stayed in unit 1594 for 9 nights in January 2019. The view was outstanding and the condo was exactly updated as shown in the photos. While the balcony was very small, we had enough room to eat meals out there with the stools and table provided. The pantry had a few items such as plastic wrap, coffee filters & powdered creamer, cooking spray and salt & pepper which was nice. There were some beach items (a couple of chairs, an umbrella and snorkel set) in a closet but no beach towels to use. The bed was comfortable enough however a king size bed would have been nicer. I did find it difficult to sleep though with the noise from people on the street and marina below as well as the wind constantly rattling the window. Parking was not included and was $23 per night in the parkade or $1 per hour on the street. We didn't have a problem finding street parking overnight as we were gone most of the day. We had one issue to contact Chris about during our stay and were impressed on how quickly he responded. While the ant issue can happen anywhere, I do hope Chris was able to have someone in to clear up this problem so future guests don't have to put up with it while on vacation. I would definitely consider staying in this location again. I loved the view and the proximity to Ala Moana beach. Wonderful location with gorgeous views! We stayed at the Ilikai Marina last year and were so pleased we could book another condo there this year. Chris was a great host and replied quickly to any questions we had. The apartment was very comfortable and had everything we needed. Definitely hope to be able to come back again next year. Overall we enjoyed our stay here.